WEB DESIGN CAN BE CONFUSING. BUT IT DOESN'T HAVE TO BE. You know your business. We tell your story. Effective communication is integral to the success of your organization. Most companies fail to communicate their products & services because of an influx of knowledge tied to their own industry. Sometimes all it takes is an extra set of eyes and ears to help better communicate to your customers. At Valiant Branding, we help tell your story. 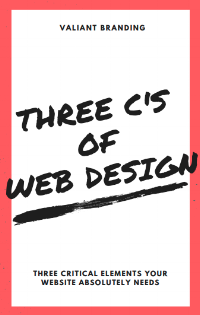 Enter your name and email address below to receive your FREE e-book titled, "Three C's of Web Design". We are excited for you to dive into our e-book. We hope you find it beneficial to the implementation of our website and markeging resources. Click HERE to download! Want to have lunch? We would love to sit down with you and hear your story.